Last Day of MavenSocial’s ARE YOU A SOCIAL MEDIA GURU? Contest! We can’t believe that it has been 4 weeks already, but it has! For the past month, people have entered MavenSocial’s ARE YOU A SOCIAL MEDIA GURU? contest and answered weekly questions on the social media industry. They have played against their friends, and climbed the leader board each week to try and become MavenSocial’s social media guru! While being crowned MavenSocial’s social media guru king or queen would be prize enough 😉 the grand prize is an 11-inch MacBook Air! Enter now if you haven’t had a chance! 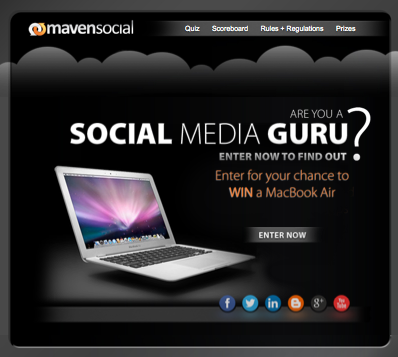 MavenSocial’s ARE YOU A SOCIAL MEDIA GURU? contest ends today! ← We asked, you answered. What is a Social Media Influencer?